Sometimes you go to a party and sometimes the party comes to you. With Pas de Deux the party always comes to you. This fun, light-hearted sparkling wine is great for just about any occasion and many different types of food. JD gets his beads while we enjoy the gumbo. 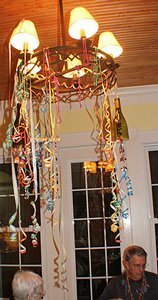 Our stay this year included some of the days leading up to Fat Tuesday. 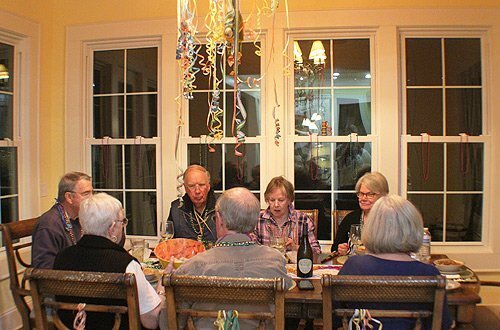 So we had our own party that included gumbo, beads, hats, noisemakers and wine. 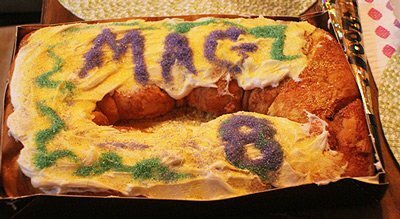 We even had a king cake imported from New Orleans. Of course, we played lots of Cajun and New Orleans Jazz music, thanks to Pandora. Steve and Edith wait for their slices of king cake. One of the hits of the evening was the Pas de Duex, produced by Biltmore. The wine is made in North Carolina, from Muscat Canelli grapes grown in California. The grapes are fermented in stainless steel at cool temperatures. The wine then spends another 6-12 months in the bottle undergoing a second fermentation which produces the bubbles. Serve this wine well chilled, about 45-50 degrees. The wine is produced in the same way Champagne is made in France, but if the wine isn’t made in Champagne you have to call it something else. This would be considered a sparkling Moscato. The wine is a gorgeous yellow/green in the glass with plenty of tiny bubbles. The delightful aroma is full of floral notes with some hint of tropical fruit. Crisp strawberry and lemon flavors fill up your mouth in a smooth, creamy style. I would call it an off-dry style, with just the right amount of sweetness. The label is full of what look like rising bubbles. With lots of pink on the label and pink foil over the cork, you think it might be a rosé, but it is not. The label is a big improvement over the original label of this wine, a pair of ballet shoes with ribbons trailing behind. That’s a nod to the name of the wine, a classic ballet term which means “steps of two,” or a duet. Whatever the label, I would call this wine wonderful. 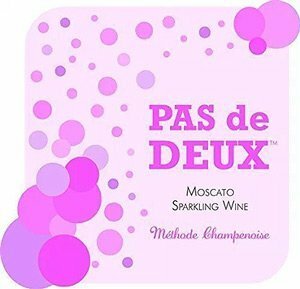 Anyone who likes a little bit of sweetness in their sparklers will love Pas de Deux. Winery: Located in the historic Biltmore Estate in Asheville, N.C., the winery is one of the most visited in North America. Though the 250-room chateau on the estate is more than 100 years old, the first grape vines weren’t planted until 1971, by George Vanderbilt’s grandson, William A.V. Cecil. Cecil brought in a sixth generation French winemaker, Philippe Jourdain, to help find the right grapes for the property. The vineyard was expanded to 150 acres in 1981, and in 1985 a winery was opened in the estate’s former dairy barn, which had been designed by Richard Morris Hunt, the architect of Biltmore House. Grapes grown on the estate include Cabernet Sauvignon, Cabernet Franc, Merlot, Riesling, Chardonnay and Viognier. Grapes also are sourced from California and Washington. The winery produces about 15 varieties of wine each year, about 120,000 cases. 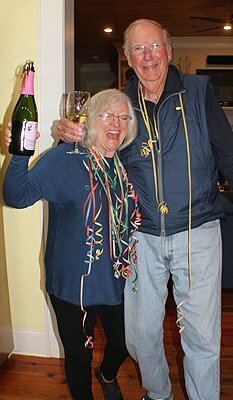 The locally grown wines can be very good (especially their sparkling wines) and the program using west coast grapes has some outstanding wines. One of my favorites is the Blanc de Noir, a rosé sparkling wine. Activities at the winery throughout the year include barrel tastings, cooking demonstrations, food and wine pairings and jazz and blues performances. The winery is definitely worth a visit. The Magnificent 8 celebrate Mardi Gras. Goes with: We had this wine as an aperitif and with our main course, gumbo. 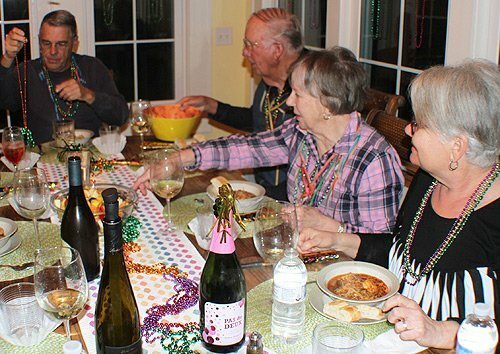 We had a crusty baguette and a fruit salad to accompany the gumbo. 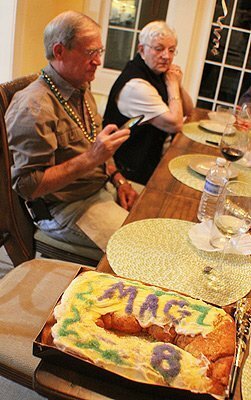 For dessert we had the king cake, which Sandy decorated beautifully with the icing and sprinkles that came with the cake. No one found the plastic baby hidden in the cake the first night, but the cake was so large we had it a couple of other times and eventually JB found it. The gumbo is something I love, though it takes a few hours to make. You start with the roux, a mix of flour and oil that you stir constantly over heat until it becomes a beautiful caramel color. Then you add the Cajun holy trinity of celery, bell peppers and onions. I also add chicken, shrimp, crab and crawfish tails. I adapted my recipe from Pat Conroy’s. For some reason, his recipe doesn’t include okra, but I added that in. I also use filé powder and andouille sausage. I add some red pepper to give the gumbo a little bite. After it cooks for several hours, serve the gumbo over rice. The hint of sweetness in the Pas de Deux nicely complemented the rich, spicy gumbo. We had some other wines with dinner, but the Pas de Deux worked well as an aperitif, with dinner and with dessert. It goes well as an aperitif or with cheesecake, chocolate covered strawberries, creme brulee, fresh fruit, shrimp, lobster bisque, or with a weekend brunch. JD picks out his beads. Sandy and JB enjoyed the Pas de Deux.